While attending a recent Association of Fundraising Professionals chapter meeting, Karla Williams challenged the audience on their title within their respective organizations. By a show of hands it was amazing how many fundraisers held the title of “development officer.” To an outsider, or newcomer to the nonprofit sector, these terms are used interchangeably. 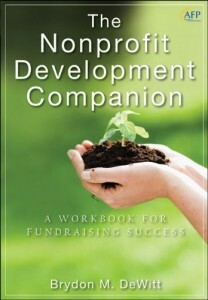 However, doing so is a disservice to nonprofit professionals and the sector as a whole. I recommend purchasing this book as an adjunct to the seminal work on fundraising, Achieving Excellence in Fundraising (Wiley Desktop Editions), because it completes the context of fundraising within the wider construct of development.